Kleisch started the company after a conversation with food scientist Jarret Stopforth, who was interested in eliminating the bitter taste of coffee. “He’s been a food scientist for 25 years, so anytime he drinks or eats anything, he’s always thinking to himself, How can I improve this and make it better?” Kleisch says. As they researched the idea, the pair recognized the environmental need as well. The team studied research from coffee chemists about the compounds found in the drink; there are more than 1,000 compounds in a roasted bean, and 40 of those are critical for taste. Those chemical compounds can be found in other natural, plant-based ingredients. In the first experiments, Kleisch says, they realized that it would be possible to eventually re-create the flavor. By leaving out the acid that gives coffee its strong bitterness, they could also make a drink that didn’t need the addition of cream or sugar. 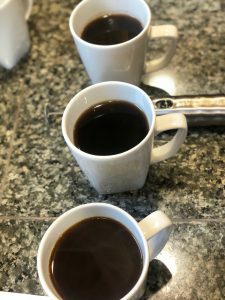 “Then we had to get creative–what other naturally derived ingredients can we use for the body to give it that mouthfeel, or how can we change it to a dark, blackish-brown color?” he says. They started with a product that is brewed as a liquid, but realized that they also had to re-create coffee grounds that could be used in a French press or drip machines. “You want your morning ritual to stay the same.” To make the correct texture, they’re experimenting with food waste such as watermelon seeds and the hulls from sunflower seeds. In a small taste test on the University of Washington campus, 70% of students preferred Atomo’s “coffee” to Starbucks. The startup is now working with Mattson, a food and beverage innovation company, to perfect the formula before they bring it to market, initially selling directly to consumers. The team is currently crowdfunding on Kickstarter. The founders see the product as a way to help meet the growing demand for Arabica beans, in particular, which grow in a narrow temperature range. But reverse-engineered coffee doesn’t solve the problem of how small coffee farmers can continue to make a living in a warming world; in Colombia alone, hundreds of thousands of producers rely on the crop. But if climate change moves fast enough, it’s possible that a solution like beanless coffee may be necessary to meet demand, and we’ll need some sort of just transition for the farmers who can’t grow their cash crop any longer.